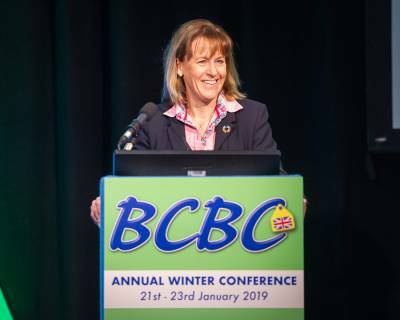 ‘Building the Brand to Promote our Uniqueness’ was the theme of the packed 2019 BCBC Conference, held in Telford last week. Over 300 delegates, across two and a half days of the conference, had the opportunity to hear from world class speakers, discuss new research and industry initiatives, and network with other farmers, scientists and industry professionals. NFU President Minette Batters opened the Beef Day (Tuesday 22nd) of the conference, speaking about the opportunities the Livestock Information Service (LIS) offers to future policy. She discussed how the service will enable the industry to utilise the enhanced data in order to drive improvements to productivity, while delivering higher health, welfare and environmental outcomes. Dr Robert Banks from Animal Genetics & Breeding Unit, University of New England, Australia, spoke about the opportunities and issues that genomic data could bring to breed societies, while Max Tweedie from New Zealand Beef & Lamb Genetics gave an insight into how objective data is being used to shape breeding decisions in New Zealand. From Ireland, Mathew Murphy, Farm Manager at Newford Suckler Demonstration Farm, gave an insight into using AI on a 100-strong suckler herd. Beef Cattle Shorthorn Society’s Beef Student of the Year 2018, Henry Schofield, discussed his vision for profitability and sustainable suckler beef production. 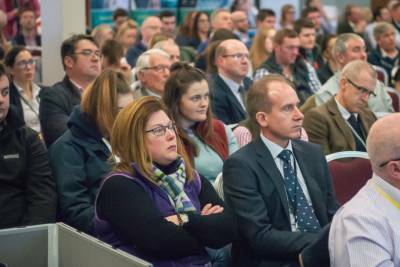 Alex Brown, from AHDB, launched the ‘Shout about the Sire’ campaign at the conference, highlighting the benefits to both beef and dairy farmers of registering sires on cattle passports. Robert Drysdale, Director of StraightLine Beef, opened the afternoon session talking about his journey to bring dairy beef from by-product to an ethical and sustainable resource. Yorkshire beef farmer, James Cooper, spoke about how he has differentiated his pedigree Limousin bulls, initially by achieving a high health status, then by producing bulls whose offspring would calve easily and grow quickly. Head of Asia Pacific Exports, AHDB, Jonathan Eckley, drew on his experiences with pork to discuss the international opportunities for beef. Dr Stephen Miller, Director of Genetics Research at Angus Genetics Inc focused on how the adoption of genetic recording and performance technology has helped aid this process and the Angus breed’s success in America. Professor Eileen Wall brought the Beef Day to a close with the results of a large Defra, Scottish Government and AHDB funded programme to generate the information and knowledge that underpins the inclusion of feed efficiency in the UK breeding goals. The Dairy Day (Wednesday 23rd) at the conference was opened by the UK Chief Vet Christine Middlemiss, who discussed her perspective on UK animal health and welfare. She gave an insight into her international role representing the UK livestock industry and promoting its USPs. Vet Oliver Hodgkinson and dairy farmer Fraser Jones talked about taking a proactive approach to herd health on a farm level. This was followed by AHBD’s Marco Winters who gave a comprehensive dairy breeding update. Dairy farmer and Chairman of the Jersey Milk Marketing Board, Andrew Le Gallais, gave a fantastic insight into how the brand has been developed in recent years to appeal to niche customers in the UK and extensively to aspirational customers in the Far East. Andy Venables, Cheshire dairy farmer and marketing consultant, looked at where the opportunities lie for marketing milk and dairy products. Dairy PhD student Amy Jackson, talked about new research investigating the attitudes people hold about year-round housed dairy cows, other aspects of cow management and milk production, and how factors such as age, gender, experiences and value system might affect their preferences. Josh Dowbiggin, Agriculture Manager – Dairy, The Co-op, gave an insight into why the long-standing commitment to British farmers and growers are is a vital part of the Co-op’s policy. Francis and Bronwen Percival, writers and cheese buyers talked about how cutting-edge science is helping to reunite farming and flavour in cheesemaking. Bryce Cunningham brought the conference to a close with his presentation on how he undertook the two-year long switch to establishing an organic, calf-at-foot dairy herd and how he successfully developed links within his local community and further afield in order to sell milk directly to customers.